How-to Paint Wicker Furniture Like a Pro! Do you just love old wicker furniture and the romantic look it gives any room or decor? 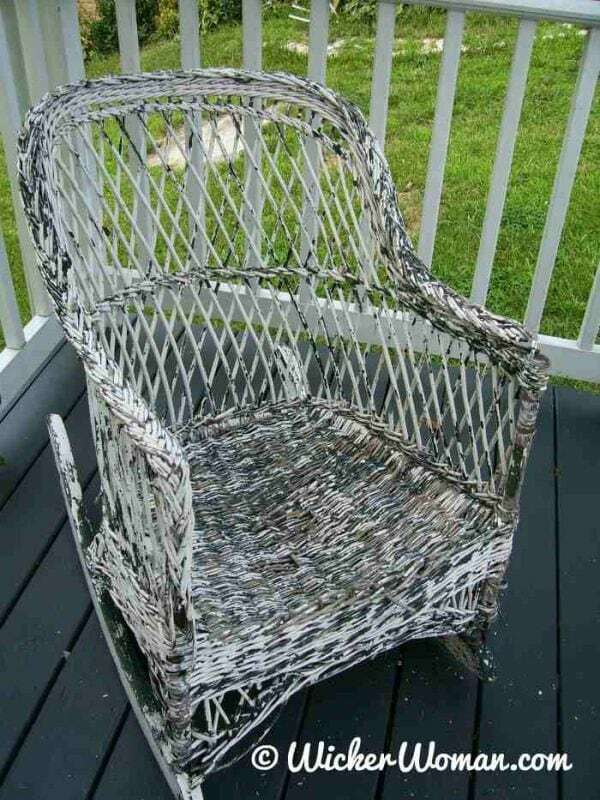 Do you own wicker pieces that have seen their better days? Well then, it stands to reason that at some time or another you might need to know how-to paint wicker furniture like a pro to help extend its life. So I’ve set up this handy wicker furniture painting tip sheet answering the questions I’m most often asked about how-to paint wicker. If you find this information helpful, please consider a donation! Flaking paint on rattan reed wicker rocker. Question: What’s the first step in painting wicker furniture? Answer: Preparing the wicker pieces is very important for a good quality paint job. So the first thing to do is to determine what kind of wicker you are dealing with because some of the cleaning methods are different for each type. The most common are rattan reed and paper fibre, but they each require different paint prepping and cleaning treatments. The next step is to begin removing all the flaking paint that you can. Get a soft brass or wire brush and scrape off as much as possible. If it’s flaking badly, I have also found success using the side of a flat-head screwdriver blade or a house paint scraper tool, but be careful not to damage the wicker strands or weave as you scrape. Prepping wicker is important! Got stubborn paint? Sometimes, if you are sure you are dealing with a rattan reed wicker piece, (rather than the paper wicker) the flaking paint can also be removed at a high-pressure car wash where you spray the piece yourself. Keep in mind that it’s very easy to damage the rattan reed with the extremely high pressure and the water may weaken the glue joints. Make sure the piece is completely dry before proceeding further. Leave it outside to dry on a warm, windy day. Once the wicker piece is thoroughly dry, and you’ve removed all the paint that you can, lightly sand the rough edges to blend and also rough up the surface for the best paint adhesion. Question: Do I have to use primer before painting wicker furniture? Answer: Yes, you really should. Be sure to apply at least two coats of oil-base wood primer to the bare spots, or the final paint coat will absorb like crazy, adding to your costs. The use of a primer is especially important if you are changing the color of the piece from dark to light. Then after the primer dries, apply two light coats of oil-based paint, using either a compressor sprayer, spray can or brush to apply. Question: What type of paint is used on wicker? Answer: I recommend using an oil-base indoor/outdoor house paint, applied using a compressor sprayer. It remains flexible, adheres to the wicker readily, and is extremely durable. In years past, I have seen far too many wicker pieces painted with Latex, that begin to flake off only after a few years of application. However, there are many wicker experts, that swear by the good results they are experiencing with the new Latex paint products. Consult a paint expert at a reputable paint store before purchasing your supplies. FYI: The quality of the spray paint cans has really improved over the years since I began painting wicker over 40 years ago. So you might find them more to your liking, but it will take several cans of spray paint to finish the job well. 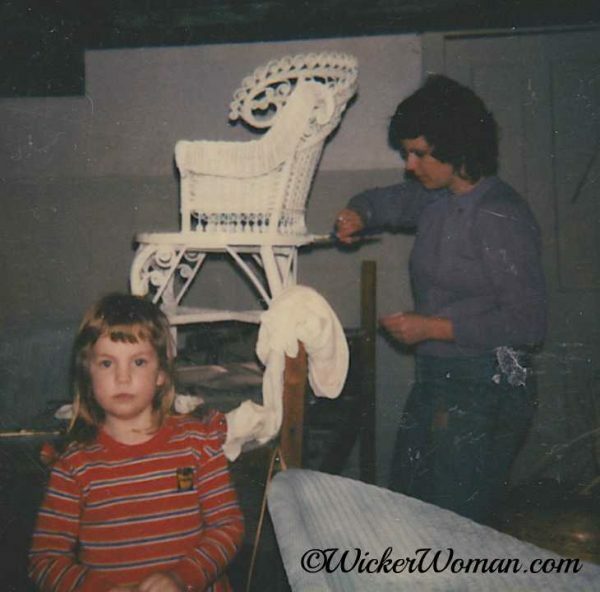 Question: So, just how do you paint wicker furniture after it’s all prepped? Always wear protective face mask and safety glasses and use good ventilating methods if painting indoors. Protect surrounding areas with drop cloths and if painting outdoors using a spray method, only spray the paint on a windless day. The best way to paint wicker in my opinion, is to use a compressor paint sprayer , using oil-base house paint. Please do your own research before making your purchase of a compresser, get what you need for your particular project. If this is not possible, and you only have one piece to do, I recommend using a natural bristle paint brush to apply the oil-base paint, or if you wish, use the spray can method. Buy the best quality paint available and make sure it’s compatible with the existing paint already on the piece, and use a wood primer, touching up any bare areas before painting. When you use spray paint cans, quite a bit of paint is lost in over-spray and can end up being quite expensive in the long run. So, you can either buy a paint spray booth or shelter or set up a home-made spray booth, fashioned out of an appliance cardboard box. A spray booth helps reduce overspray either way, whether you use the spray cans or a compressor sprayer. Be sure to turn the chair upside down and paint all visible areas first, then tip upright and apply paint to all visible areas, getting into all the crevices and corners. Give at least two light coats of paint and be sure to clean up any spills and drips immediately and don’t “glob” on the paint with thick coats. Let all coats of paint dry before applying the next, and make sure you don’t sit in the chair until the paint has thoroughly cured for about a week. Enjoy your newly painted wicker furniture! Disclaimer: This article was written by Cathryn Peters based on her own personal experiences and knowledge about the antique wicker furniture industry acquired over the last 40+ years of providing wicker restoration services. Viewers may follow these directions using their own best judgment and no liability concerning your results is assumed by The Wicker Woman or Cathryn Peters. Join this Weaving Community list for valuable emails, blog post updates, events, and hints & tips about wicker furniture for your weaving delight! Great! Just one more step! Please click the link below to confirm your email address and complete the sign-up process. Otherwise, you won't get all these great weaving hints & tips! 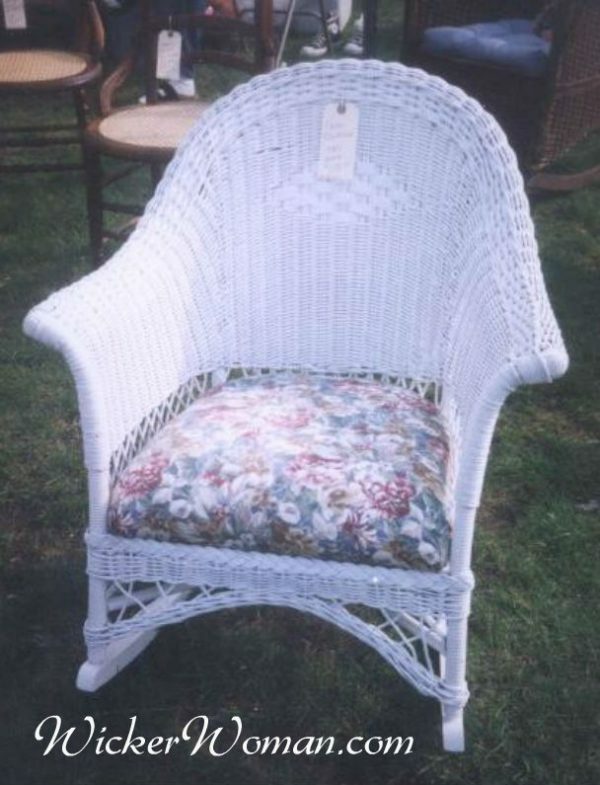 If you’d rather not paint wicker yourself, search the National Furniture Repair™ here on WickerWoman.com for someone to make any wicker repairs that might be needed or to strip, prep and repaint the wicker for you. Hope this FREE How-to Paint Wicker Furniture article helped you today. Thanks for supporting WickerWoman.com with your kind donation! And please come back often to see the additions and updates to WickerWoman.com! Next –> What is Paper Fibre Rush or Paper Wicker?